Consistency is important when it comes to water pressure in plumbing and heating systems. Achieve ideal consistency with these Pressure Valves by the industry's leading brands. 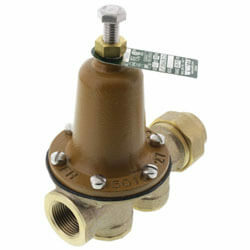 Pressure valves are used to maintain a constant water pressure in plumbing and heating systems. There is no single pressure valve that can be used in every application. We provide pressure reducing valves, differential bypass valves, and differential pressure regulators. Pressure reducing or "feed/fill" valves are used to reduce incoming water pressure for plumbing system components, and water consumption. They automatically feed water to a system whenever pressure in that system drops below the preset pressure setting. This is what occurs in the event of a system leak. 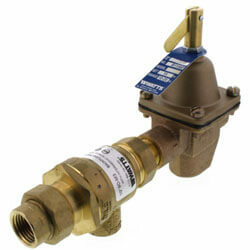 Some pressure reducing valves come equipped with a backflow preventer. This combination simultaneously provides make-up water to the boiler and prevents backflow siphonage when supply pressure falls below system pressure. 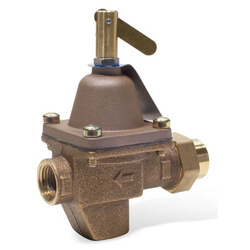 Differential bypass valves provide accurate and dependable means to control excess flow in zone valve systems. A reduction in demand for heat causes excess water flow. This reduced heat demand often occurs as zone thermostats are satisfied and their parallel zone valves close. This causes the system pump to try and force more water through the remaining zones. Installing a differential bypass valve between the discharge of the system pump and before the inlet of the pump prevents velocities from being pumped through the zones that remain open during reduced demand periods. 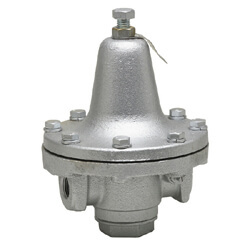 Differential pressure regulators are used to eliminate excessive pump head pressure when most radiator valves are closed due to reduced demand. They are built into the system where a constant differential pressure is desired and used to provide a constant flow regardless of variations in upstream or downstream pressure. Differential pressure regulators are often times installed at the connection point between a district heating system and a consumer building, ensuring that there is a constant differential pressure available for the building's heating system. 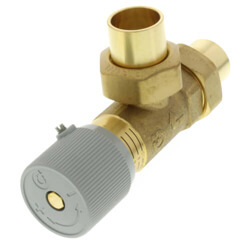 Our website offers a wide selection of Watts, Taco, and Bell & Gossett pressure valves to suit all your heating and plumbing needs.